Can you confirm these amateur observations of Nerodia fasciata? confluens: Arkansas, Louisiana, Alabama, Mississippi, Missouri, E Texas, Oklahoma; Type locality: Butler County, Missouri. pictiventris: Florida, Georgia, Alabama, S Texas; Type locality: Gainesville, Florida. Reproduction viviparous. Hybridization: Nerodia sipedon and N. fasciata hybridize “massively” in their contact zones, e.g. in the Carolinas and Georgia (Mebert 2008). Diagnosis DIAGNOSIS: This snake may be distinguished from the peninsular N. s. pictiventris, which it resembles rather closely, by the shape of the ventral markings-squarish spots in fasciata, elongate dark areas near the anterior margins of the ventrals in pictiventris-and by the presence generally of more than 128 ventrals in fasciata and fewer than this numberin pictiventris. The dorsal pattern of transversebands throughout the length of the body will usually distinguish fasciata from pleuralis, in which most often the posterior portion of the dorsal pattern is composed of alternating dorsal and lateral spots. Furthermore,the belly of pleuralis is marked with half-circular spots. N. s. confluens and fasciata may be separated on the basis of the number of dorsal saddles, the former having 11 to 17, the latter about 19 to 30 [CLAY 1938: 178]. 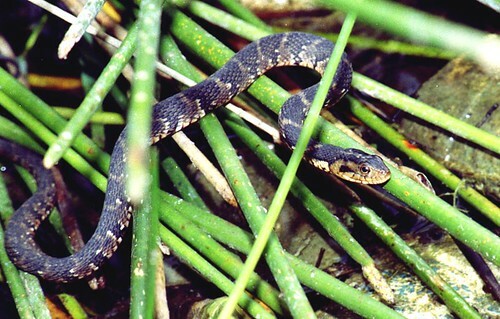 DIAGNOSIS (confluens): This species is easily recognized by the number of dorsal cross bands, 11 to 17, which is lower than that of any other Americanspecies of Natrix. In most other respects, including scutellation and proportions, it is fairly similar to N. s. fasciata [CLAY 1938: 179]. 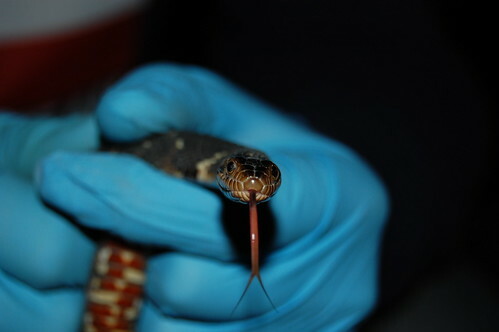 DIAGNOSIS (pictiventris): The typical dorsal markings of this snake consist of a series of 26 to 35 reddish-brownto black cross bands, but in mature individuals the lateral interspaces sometimes become darker than the lateral portions of the cross-bands and thus produce an appearance of alternating dorsal and lateral spots. For differences between this form and N. s. fasciata, see the latter (p. 179). From N. s. compressicauda it may be distinguished by the absence or poor delineation of a midventral series of light spots [CLAY 1938: 180]. Comment Illustration in Reptilia (Münster) 8 (2): 21. Illustration of N. f. pictiventris in SCHMIDT (2004). Synonymy: BLANEY & BLANEY 1979 suggested that N. fasciata is synonymous with N. sipedon. Habitat: at least partially coastal and thus considered (partially) “marine”. Distribution: introduced to S California (Reed et al. 2016). Enge, Kevin M. 2009. 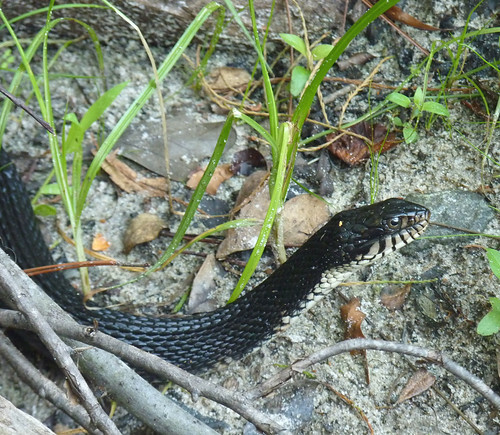 Venomous and non-venomous snakes of Florida. Publication of the Florida Fish & Wildlife Conservation Commission. 16 pp. Ernst, C.H., & Barbour, R.W. 1989. Snakes of eastern North America. George Mason Univ. Press, Fairfax, VA 282 pp. Gibbons, J. W. & Mike Dorcas 2004. North American Water Snakes. University of Oklahoma Press, 496 pp. Irwin, Kelly J. 2004. Arkansas Snake Guide. Arkansas Game & Fish Commission, Little Rock, 50 pp. Jensen, John B.; Carlos D. Camp, Whit Gibbons, & Matt J. Elliott 2008. 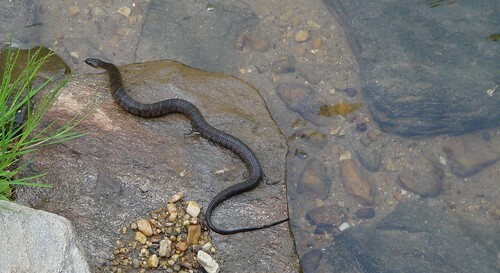 Amphibians and reptiles of Georgia. University of Georgia Press, 575 pp. Mebert K. 2010. 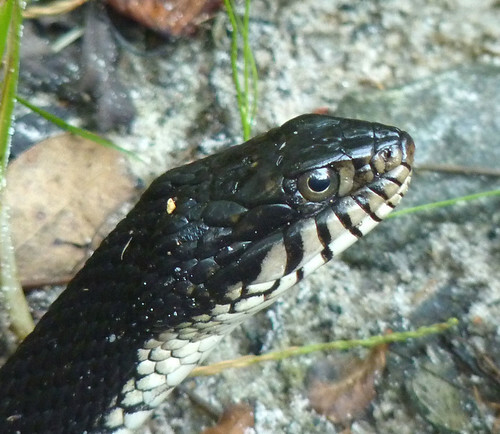 Massive Hybridization and Species Concepts, Insights from Watersnakes. VDM Verlag, Germany, 187 pp. Reed, Robert N.; Brian D. Todd, Oliver J. Miano, Mark Canfield, Robert N. Fisher, and Louanne McMartin 2016. 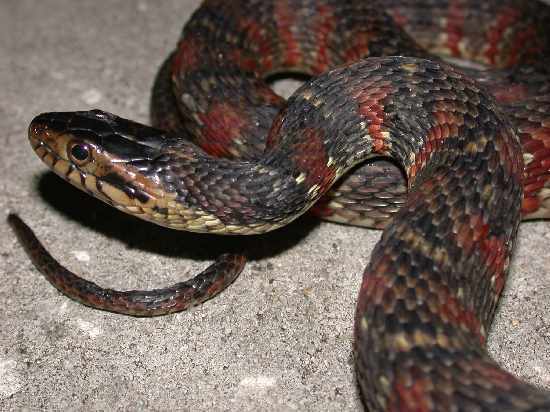 Ecology and Control of an Introduced Population of Southern Watersnakes (Nerodia fasciata) in Southern California Herpetologica Jun 2016, Vol. 72, No. 2: 130-136. Schmidt, Karl P. 1953. A Checklist of North American Amphibians and Reptiles. 6th ed. American Society of Ichthyologists and Herpetologists, Chicago, 280 pp. Tennant, A. 2003. Snakes of North America - Eastern and Central Regions, revised edition. Lone Star Books, 605 pp. Tennant, A. & Bartlett, R.D. 2000. Snakes of North America - Eastern and Central Regions. Gulf Publishing, Houston, TX, 588 pp.